Nobody in Germany thinks of baking regular, plain white rolls at home. You get them freshly baked everywhere, in bakeries, supermarkets, and even in gas stations. Every German region has them, called “Rundstück” in Hamburg, “Schrippe” in Berlin, “Semmel” in Munich, or simply “Brötchen” (= little bread). The typical Brötchen has a crackly crisp crust and a fluffy, soft, easy to pull out crumb. It has nothing in common with its soft, sweet and chewy US cousin, the dinner roll. And American Kaiser Rolls are just Kaisersemmel wannabes, they share only the pretty star cut with their Bavarian or Austrian ancestors. One of the greatest woes of German expats is the total lack of this everyday staple in the US. No Brötchen to be found anywhere – perhaps bad imitations, but never the real thing. And worse: no cookbook would even list a recipe! In those days I had no clue about the differences between European and American flours. I only knew they were categorized in a different way, European flours by their ash content (meaning what is left if you burn it) and American ones by their protein level. One day we were shopping at our favorite Italian grocery, Micucci, in Portland. I saw Italian flour Tipo 00 on their shelves, and bought it, more out of curiosity then anything else. I remembered it listed as an ingredient in one of my most favorite bread baking books from a bakery in South Tyrol, Italy. In Ploner’s “Brot aus Südtirol” I had finally found a recipe for Brötchen. I tried them several times, just assuming “Tipo 00” would be the same as all-purpose flour. Frustratingly, every time the rolls turned out lean and chewy, more reminiscent of French bread. But when I used the Italian flour, I finally nailed it: my rolls had the soft, fluffy, “pull-out” crumb typical for Brötchen. Wikipedia told me why: US wheat has much more protein compared with European wheat. Protein rich flour develops a strong gluten structure, so that the crumb is airy and chewy. Soft, low protein flours, like German Typ 405, or Italian Tipo 00, have much less gluten and bake into breads with a denser, fluffier crumb. For an American/European flour “translation“, click here. 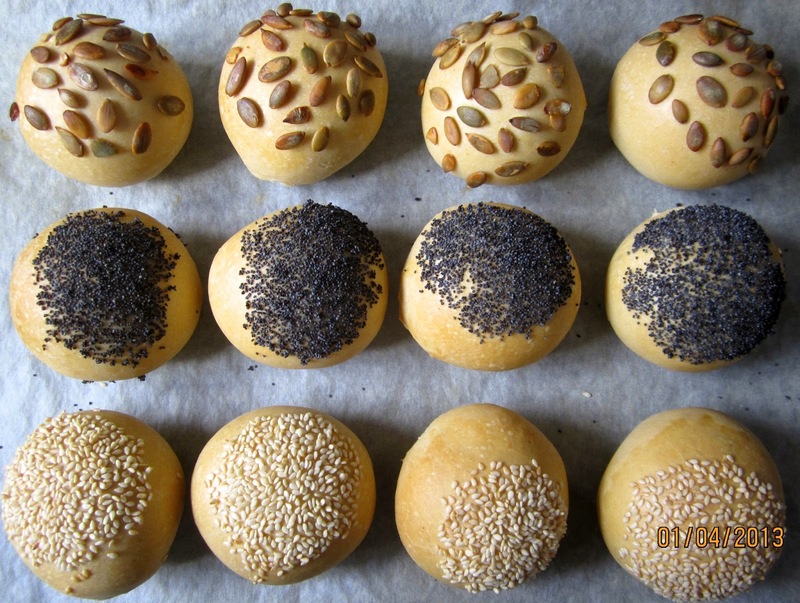 I like a crunchy seed topping (as shown in the photos), but you can also give your rolls or a simple shiny, crackly glaze, so that they look like Rundstücke. In the evening, stir yeast into lukewarm water until dissolved. Mix all ingredients for 1 minute at lowest speed (mixer or wooden spoon). Let dough sit for 5 minutes. Knead on medium-low speed (or with hands) for 2 minutes. Dough should be supple and still a little bit sticky (adjust with water if needed). Continue kneading for 4 more minutes, increasing speed to medium-high for last 30 sec. Dough should be very tacky, bordering on sticky. Transfer dough to lightly floured work surface. With wet or oiled hands, stretch and fold dough like a business envelope in thirds, then turn it around 90 degrees, and fold from short sides the same way. Gather dough ball, sides tucked underneath, and place it in lightly oiled bowl. Cover, and let rest for 10 minutes. Repeat these stretches and folds 3 more times, every 10 minutes (40 min. total time)*. 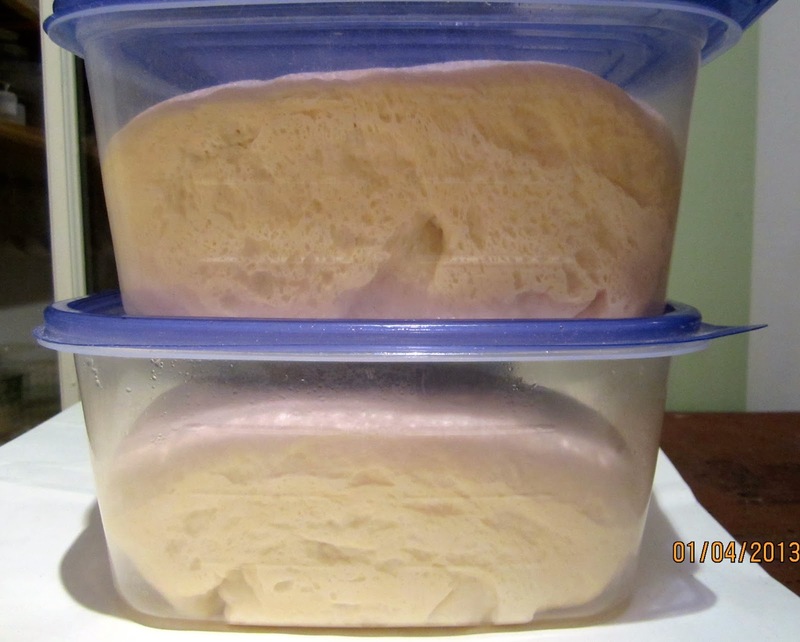 Place dough in oiled bowl or container with lid (I divide it at this point in halves, and use 1-qt plastic containers). Roll dough around to coat all over with oil. Cover with plastic wrap or lid, and place in the fridge overnight. *This technique is described in detail in Peter Reinhart’s “Artisan Bread Every Day“. 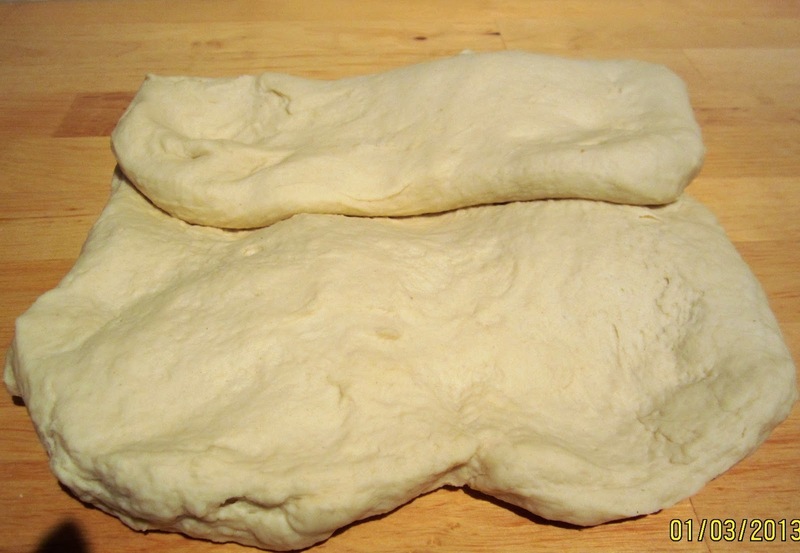 Remove dough from refrigerator 3 hours before baking, to de-chill and double their original size. 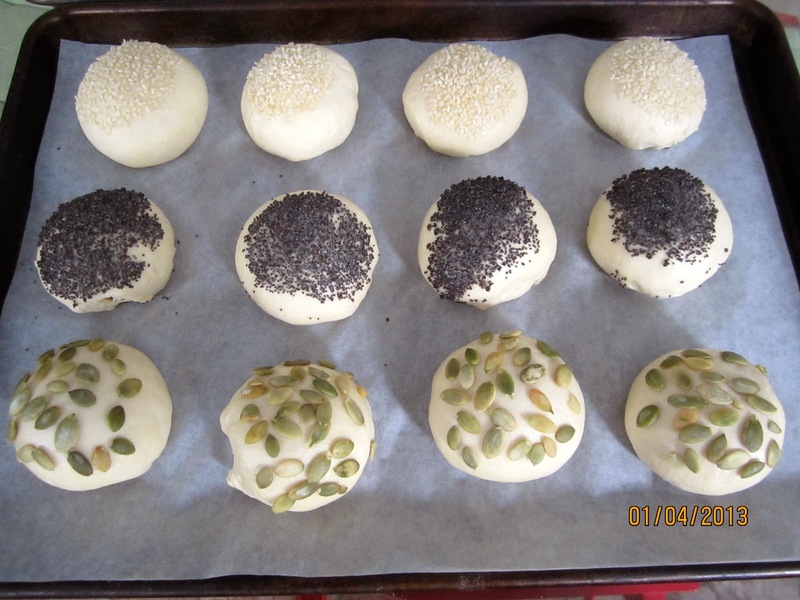 Prepare egg wash and three bowls with sesame, poppy and sunflower seeds for topping. Line baking sheet with parchment paper. 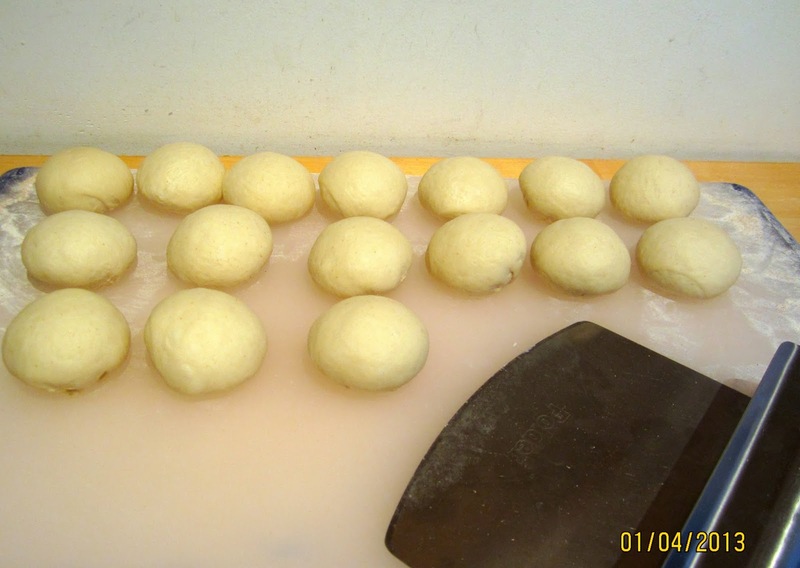 Shape dough into 12 little rolls. Preheat oven to 428º F/220º C, including steam pan. Brush proofed rolls with cornstarch glaze (if using). Place rolls in oven, pouring 1 cup boiling water in steam pan. Bake for 9 minutes, then re-brush with cornstarch glaze (if using), rotate baking sheet 180 degrees for even browning, and continue baking for another 9 – 10 minutes, or until golden brown (internal temperature at least 200º F/92º C). Leave rolls in switched off oven for 10 minutes more (leave door a crack open), before taking them out to cool on a rack. http://bunfiles.breadstorm.com/bunfiles/RWY79E/H27EKR/embed.html Freerk of BreadLab made a very nice video clip of how to make these rolls – view it at YouTube. 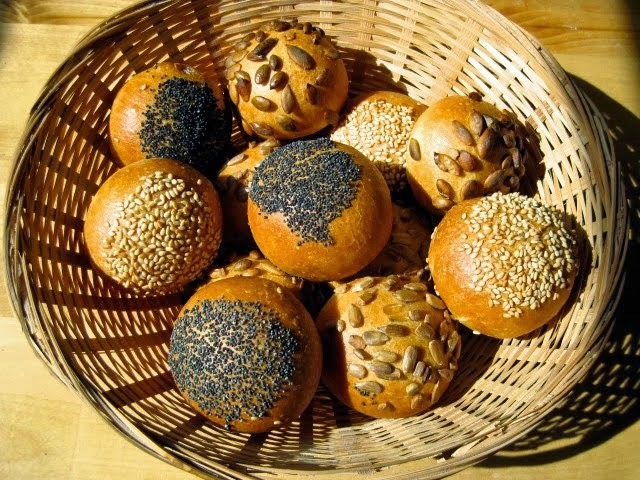 And check out Joanna’s Brötchen post at Zeb Bakes, one of my favorite blogs with great breads and lovely photos. Ian, from Mookie Loves Bread made the rolls with fruit yeast water and a toasted onion, black sesame, Asiago cheese and flaxseed topping. Hanseata, hast Du dies mal angeschaut ? Hallo, Anna, ich habe verschiedenste Rezepte ausprobiert und mir dieses auch angesehen. Eine Schwierigkeit sind ja die unterschiedlichen Mehltypen in den USA (proteinreicher als die deutschen). Ich wollte unbedingt ein Broetchen backen, das die “herausnehmbare” Krume hat, wie ich sie von den Rundstuecken aus Hamburg gewoehnt bin. Ein anderes Problem ist immer eine wirklich krosse, aber trotzdem nicht zu dicke Kruste zu erzielen (endlos in Backwebsites wie “The Fresh Loaf” diskutiert). Mein Rezept kommt diesem Ideal ziemlich nahe. Das langsamere Gehen des Teigs ueber Nacht im Kuehlschrank macht die Sache nicht nur einfacher, sondern verbessert den Geschmack zusaetzlich erheblich. I'm so glad to hear that, Cometprof! When you are living in Germany and can get Brötchen every day, you don't think much of it. Nobody bakes Brötchen at home, only some fancy whole grain ones, perhaps. But when you can't get them anymore, you start dreaming of them. I wanted to thank you for your recipe above! I've been scouring the internet for years and recently stumbled upon yours. It is amazing how a simple piece of bread can be so difficult to replicate in the States. I tried your recipe exactly as indicated, but left off the egg wash with the different seeds. I grew up eating the plain brotchen and was just looking for a basic recipe. Although I have made a few adjustments to the recipe since the first time I tried it, your recipe gave me the direction I needed. Thank you so much! For those who are looking for that basic plain brotchen recipe, I offer the following tips to the recipe above. To provide a little more 'air' to the recipe, add 1 stiffly beaten egg white to the yeast and water mixture before you add the dry ingredients. If you don't want an olive oil taste, replace it with melted crisco shortening (placed in microwave for 90 seconds and then cooled to below 110 degrees). Shortening is used to 'shorten' the gluten in the flour…making it more chewy. So, I increased it to 50 grams. I also doubled the sugar to 8 grams simply for taste. Remember the dough needs to be pretty wet…so you probably will be adding more liquid. When I divided the dough into 12 equal pieces, I found the end products to be pretty large. They grew together on my cookie sheet (which is a half sheet….so it's not that small). I like brotchen a little smaller than a tennis ball, so plan on using 2 sheets if you do as well. I also found my 'double insulated' cookie sheet was actually too thick. The bottom of the roll didn't get hard. I used a thinner cookie sheet lined with parchment paper and then gave the rolls an additional squirt with a fine mist of water after the first 9 minutes. That seemed to do the trick for me. I like using parchment paper simply for clean-up reasons, but you may not have a problem with 'crustiness' if you just use the cookie sheet. All in all…the recipe is a definite keeper and I'm so glad that it was posted on the internet. I gave some to my brother and his first comment on opening the bag and taking a whiff was….”that's exactly what I remember!” and then after taking a bite….he said….”you nailed it!” Thanks again! Bring 100 g water and 2 g of corn starch to a boil, then let it cool down to room temperature. Brush proofed rolls with glaze, just before they go into the oven. When you rotate baking sheet, apply another layer of starch glaze. Then the rolls will have the crackling, shiny surface some German rolls have (Rundstücke). I just finished baking a batch of broetchen and used your recipe for the glaze. I liked the effect! Thanks for offering it! You are very welcome, Tom. 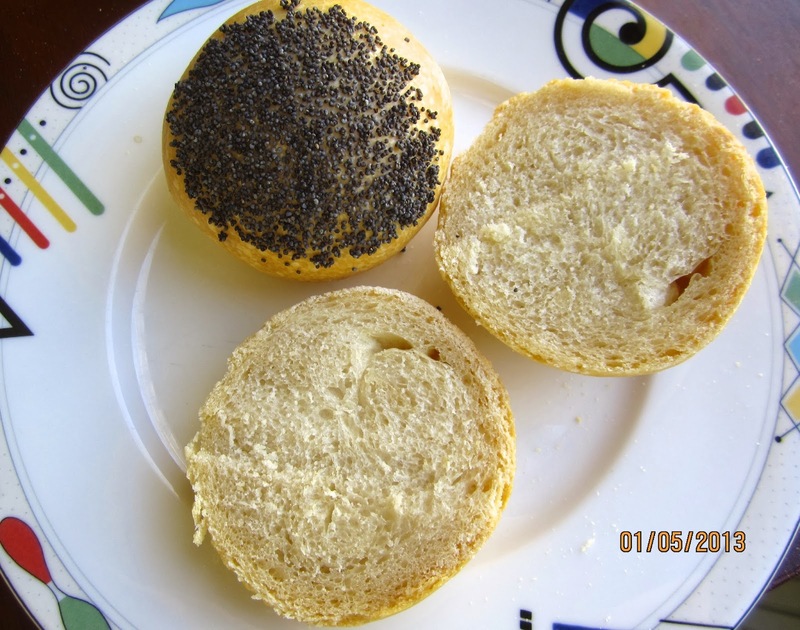 I just came back from Cancun/Mexico – no bread baker's paradise there, the white bread was all fluffy, tasteless, and had no crust. And the beautiful pastry only looked nice – it was very sweet and nothing else. Thank you for posting this brotchen recipe! We were in Germany for three years, and fruhstuck brotchen was a treat. Now, if you could only tell us how to make quark. The most acceptable substitute was full fat Greek yogurt, Fage brand. I drained it, and it seemed to work pretty well. Now I need to make this recipe for the bratwursts we will be having. Vielen Dank! Ach, ja – quark! I wish we could get it here. For German Cheesecake (see my post) cream cheese works quite well, but not for other purposes. I made do with keeping buttermilk at 150 F overnight until it curdled. That has the right consistency, but not quite the tang. For the real thing you need rennet. I have a recipe, and I was thinking of ordering some rennet online – it is supposedly not that difficult to make quark. And Bratwurst, seasoned with majoram and thyme, is one thing I miss here, too. Hi, Yvette – have you been in my hometown, Hamburg, too? I'm glad to hear that you enjoyed the Brötchen you had on your trip. You are right, the roll on your photo certainly has some rye in it. There are many different recipes for Brötchen, and I will look for one like that. We were in Bremerhaven, Cuxhaven and Bremen but didn't think we'd have enough time to visit Hamburg too (part of the trip was visiting my mother's family). We already want to go back and will definitely visit Hamburg next time! Thanks for the link, Mike. I tried making quark with buttermilk, left in a 150 degree warm oven overnight, otherwise made the same way. The texture is right, but the taste is a little bit too bland, not quite tangy enough. I'm very happy to hear that you liked them, Joanna. And thanks for the link. I will put a link in my post, too. Can anyone please convert this to U.S. measures? Many thanks! Hello! We spend a lot of time in Germany and I've been wanting to replicate the white breakfast “brotchen” rolls we eat at all of the bed and breakfasts for years (with the spiral mark on the top). We have a German bakery in our town that makes them and they don't taste right. Is this the best recipe to make those plain rolls? Would the German flour or the Italian flour work best, or are they the same? My grandma is full German and it would be such a wonderful treat to surprise her with these rolls! Thank you so much! Also, do you think butter could be used instead of olive oil? Hi, Robin, American Kaiser Rolls (those with the decorative spiral) are definitely not the same as what you get in Germany or Austria. For a crisp wheat roll with a fluffy crumb, do try my recipe. If you have German Typ 450 flour, you can use it. I can't find it here easily, but I can get Italian 00 flour that is very similar, both have much lower protein/gluten than all-purpose flour. Another possibility would be white pastry flour, if you can find it. You can use melted butter or olive oil. Great, thank you! I found both the German and Italian flour on Amazon so I'll try the Italian. Thanks for your help! I am going to try your recipe — I grew up in Wisconsin, and every bakery sold hard rolls. When I moved away, no one had even heard of them. There are many descendants of German immigrants in Wisconsin, so I'm hoping the hard rolls I loved are descendants of brotchen. Wish me luck! 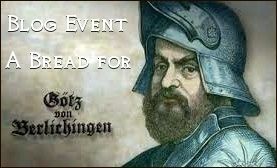 Sounds if they were – I always wonder why, with so many Americans of German origin, most of their bread baking skills were lost, and the squishy breads prevailed. Good luck, Heidi, and let me know how your rolls turn out! These were great for my first try! I had some trouble with shaping them though. I found some youtube videos on folding it over to get that “spiral” shape, but was wondering if I should do that process before, after, or during the 2 hour proofing time. I did it before and they ended up pretty flat. Do you have any idea? I used shortening this time but might try melted butter next time just for the flavor. I'll let you know how they turn out! Your corn starch wash worked great to get a crispy crust. I'm happy to hear that they turned out well. I am a beginner and have ordered the Italian flour. I would like to know the brand and size of those storage containers. You also inspired me to make a starter. Vielen Dank fuer die wunderbaren Rezepte! These are just cheap 8-cup containers with lid from the supermarket. They come in packages of 4, made by Glad and others. They work great, don't need much space and stack nicely. Hello. I too miss the brötchen from Germany. They are a wonderful memory of my childhood and a treat when I go back to visit. As you said, no one bakes them because you can buy them everywhere. I have a quick question for you. I have found German flour available for purchase here in Texas. It is the Diamant brand and Weizen Mehl Type 405. Would this also work? Yes! That would definitely work. Good luck baking them, and, please, let me know how they turn out. Hi, Mary, I'm glad you like the rolls, and thanks for sharing the result of your bread machine experiment. I used to prepare the dough for my German Feinbrot in the bread machine (also with the whole grain program) until it broke one day, and I had to come up with a different procedure. I am of German descent and just got back from visiting family there and would like to make the whole grain ones with the seeds on top that were my favorite there. My half brother's family is in Bielefeld, and my mother's family near Hildesheim. Would you have a recipe for these? Would love to make them!! What kind of rolls were those – did they have rye in it, or was it whole wheat? There are so many types of rolls, and I could certainly give you some recipe, if I knew more about the type of rolls you had. I just returned from two weeks in Germany/Austria, ate Brötchen about every morning and am anxious to try your recipe. Is Cake Flour too light in protein? Can I blend it with unblanched AP? I can get pastry flour from a nearby Amish community. I loved the research into the difference between european vs american flours. I have made this quark several times. It seems to be close to what is purchased in Germany. Purchase the dry culture (Fromage Blanc) from the Cheesemaking site. I use it to make “Quark Balls” , a recipe my daughter got from her German boyfriend's grandmother. They are now married 🙂 She called them Quarkkeulchen. A Google search turned up pancakes, not something closer to a doughnut hole. I hear Whole Foods (or one of those upscale food stores) carries quark. Hi, John, cake flour has 6-8% protein, AP 10-12%, depending on the brand (King Arthur and Hodgson Mill reach almost bread flour levels, Pillsbury and Gold are a bit softer). You can try blending, and see what results you get, but I would recommend trying the Amish pastry flour first. Thanks for the quark making link, I will look into it. Whole Foods offered quark from the Vermont Creamery for a while, but I haven't seen it there anymore, and it is outrageously expensive, since you always need more for a cake than a small tub. You are right, Quarkkeulchen are a kind of donut, definitely not a pancake. “Berliner” (the most common kind of German jam-filled donuts) are also called “Berliner Pfannkuchen”, though they are definitely not pancakes. Maybe that is the reason for the strange Google search result. Good luck with the Brötchen baking, and, please, let me know how they turn out. Thank you for your nice compliment about my blog, Marc. Yes, the crust should definitely be crispy, even though you never get it as shatteringly crisp with a home oven (same with baguettes). Have you ever tested whether your oven temperature is correct? All the three ovens I had needed some kind of adjustment, ran either a bit too high or too low. That might be the reason. If the steam evaporates too fast, you will get a thicker, tougher crust. I used different methods (depending on my ovens), either a cast iron pan, or a juice pan for roasting, or, the latest, a tinfoil loaf pan filled with lava stones. They all worked okay, since the oven door was well sealed. I always use convection (fan assisted in my old oven, or true convection in my new one). Since I run a home-based micro-bakery, I need to bake several loaves on two tiers at a time. Never had any problems with that. One quick question that I forgot. When you use convection for this recipe, do you still use the same temperature, i.e. 428 Fahrenheit, or do you reduce the temperature, because you are using convection? My oven auto-converts the temperature tor convection mode. if yours doesn't, you have to reduce it by 25°F.